Home improvement projects are in the air at CFS right now – several of us are working on projects around our houses and they are not without their… let’s just say challenges. One of the things that I have run into working on my house is non-standard sized windows and doors. Which ultimately means I cannot go down to the local hardware giant stores and grab from their stock. No, I need to place a special order and wait. I know in the end it will look great, but I’d rather get it finished fast. Well, the same situation can often times apply to report covers for your booklets – a special size is needed, differing from the standard letter 8.5×11, legal 8.5×14 or ledger 11×17 inch covers. If that happens to you, just let us know what size you need your covers trimmed to and we can get you pricing. Each job is custom quoted and all we need is the size(s), quantities and the material you need. Your covers can have square or rounded corners and they can even be prepunched for your binding elements. There is one caveat here, if you only need 100 or so covers, it may be more cost effective to buy a standard size and take them to a local print or copy shop. They usually have large paper cutters that can cut your whole stack of covers in one shot. They will most likely charge you less than the custom cut setup fee that is easily absorbed into larger quantity jobs. There is one size that we have in stock that I consider non-standard: it’s the 9×11 inch covers. 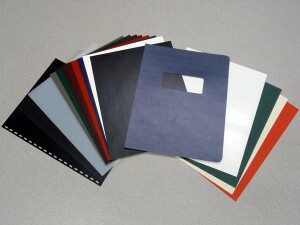 These are designed to be used on booklets with standard tab dividers. The tab extension measures 1/2″ and the 9″ wide cover provides a bit of protection for them and are available in a variety of cover types. Do you have any interesting, custom cover projects you have worked on? Please share in the comments below, we’d love to hear from you. For several years our customers have saved time, effort and some strain by using pre-punched covers with the GBC comb binding pattern. Recently, we have added clear covers with the popular 11-hole, Velo (or SureBind) pattern already punched for you. 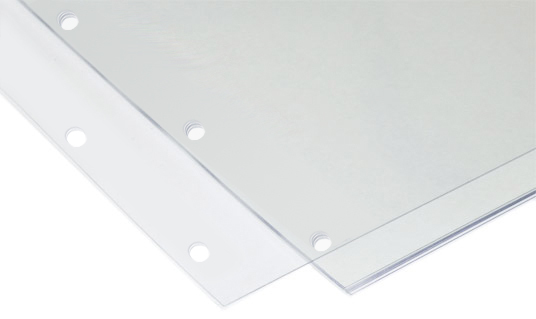 These pre-punched clear Velo covers are available in three different thicknesses: 5mil light, 7mil medium and 10mil heavy – by far, the 10mil is the most popular when it comes to clear covers. Sold by the pack of 100 covers each, they ship without tissues seperators. These are sure to save you time when punching and finishing your printed documents. Consider using our pre-punched paper to save even more punching time! Do you have any time saving tips when Velo binding? Please share them in the comments below. Q: “We need clear covers, but we don’t see the size we need on your online store. Do you have any other sizes that are not listed? A: The sizes listed online are your standard cuts that are most often used, however, we can order custom sized covers to your specifications. All that you need to do is get us the details: finished size, type/style and quantity needed. Once we have this information we will work up a quote for you. 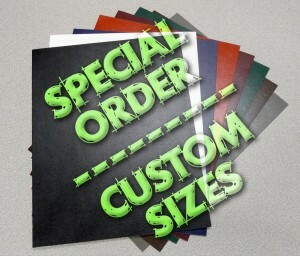 Generally, custom cut orders do have a 5-7 day production lead-time prior to shipping once you have placed your order. When determining your quantity, please keep in mind that custom-trimmed covers still need to be in multiples of 100 pieces. Also, since custom orders are cut to non-standard sizes, there is no return or refund once the job is approved and started. So take a look at our covers and let us know if there is a special size you need. Composition/Vinyl Covers are by far the most popular choice among CFS customers, often used as a back cover and paired with a clear front cover, these offer exceptional durability and protection while creating a very classy, professional presentation. Measuring 17 points thick, they are about 2 to 3 times thicker than a business card and are made up a matte paper/card stock base with a semi-glossy vinyl veneer on top. The texture resembles a stippled or pin-pricked yet smooth finish and they are available in 8 colors. Linen Covers are a paper or card stock-based cover that feature a cross-hatched, linen or cloth-like texture pressed into the sheets. 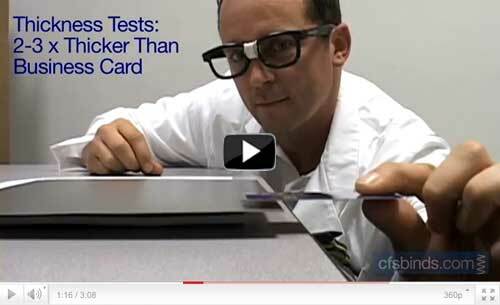 Their thickness measures in at an 80 pound card stock – much like a thinner business card paper. I like to tell people that the texture looks like a close-up on piece of cloth with threads running perpendicular to each other. Linen covers are available in 5 colors. Embossed Covers are made of nearly the same 80# card stock as the linen covers however their texture resembles an old leather look with deep, random grain lines pressed into the front. I often tell people that the grain resembles eroded rivers running across the sheet’s surface Embossed covers are available in 7 fashionable colors. 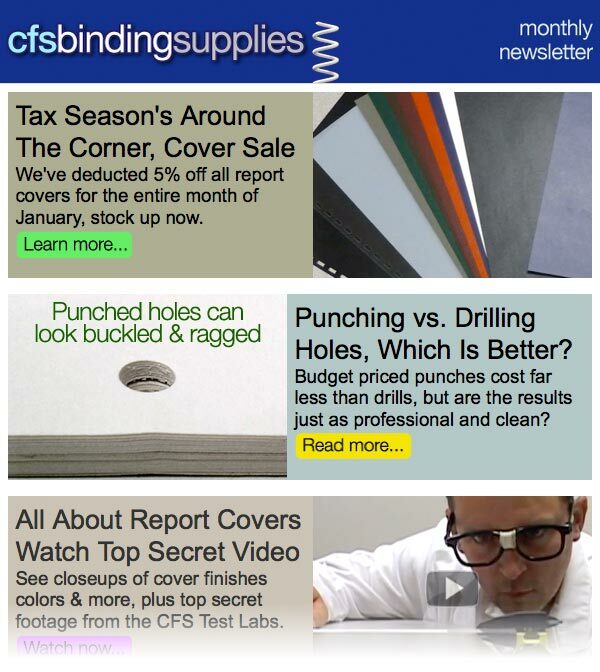 As always, if you have any questions on covers or anything binding, you can visit our website or email them to me: info@cfsbinds.com If you have any creative ways that you describe these covers to your clients or coworkers, we’d love for you to share them in the comments below.